Civil engineer, transportation planner, educator, NGO manager, mountain climber and volleyball player – Najme brought this unusual combination of skills, and more, to the Sauvé Foundation. Following her Sauvé year, Najme has pursued her career in Tanzania and Kenya, East Africa. She has been involved in the development of rich education programs for vulnerable groups including Somali women refugees in Kenya and children living in the informal settlements and slums. She also developed an education program for Somali women (refugees) in Kenya in order to integrate them within the host society. Najme’s involvement in these educational projects reinforced her strong belief in the potential of education to promote democratic citizenship and peace. This belief led Najme to abandon her doctoral studies in civil engineering to pursue her passion for education. She set out to understand what skills education should seek to develop and how these skills should be promoted in a particular society such as Iran’s in order to counter violence, exclusion, and marginalization. This brought her to McGill to study education. Najme cofounded a not-for-profit organization for educational development. Their mission is to provide Persian-language youth with essential individual skills that are not adequately addressed within these countries’ formal education systems. This organization works in partnership with a network of researchers, practitioners, and funders all over the world who share an interest in their mission. During her Sauvé year, Najme invested heavily in building this network, and also launched a program as part of their organization called “Schooling for Peace and Emotional Literacy.” This program helps young Iranians to be agents of peace and of conflict resolution. Najme designed and developed a comprehensive curriculum for developing children’s empathy, emotional literacy, and conflict management skills. Her aim is to use this curriculum to empower students with the skills to understand and respect differences and to form healthy relationships across lines of difference. The “Schooling for Peace and Emotional Literacy” program was started as a pilot project in a number of elementary schools in Iran while Najme was in residence at Sauvé House. Early evaluations showed great results: students love the activities, and teachers are engaged in developing the program. 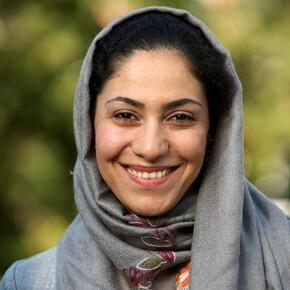 Najme will scale up this program upon her return to Iran, building on the partnerships that she forged as a Sauvé Fellow with NGOs, schools, and universities. In April 2013, Najme chaired “Diversity and Inclusive Education: Iranian and Canadian Experiences”, a presentation and panel discussion in a packed Sauvé House. In November 2014, Najme returned to Sauvé House as a participant in the first Sauvé Encore! Program. And in 2016, she led a workshop on the principles of systems thinking with the 2015-17 Sauvé Fellows.